For 2014 the Harrods Christmas Bear is called Jasper. 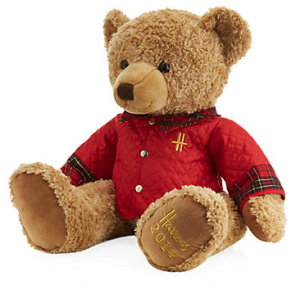 Meet Jasper, the Harrods 2014 Christmas bear. Back from his annual round-the-world trip, this furry fellow can’t wait to celebrate the most wonderful time of the year. Dressed in his red quilted jacket, Jasper loves nothing more than spreading festive cheer with kindness and cuddles. He is sure to be popular. For more information please visit Harrods.